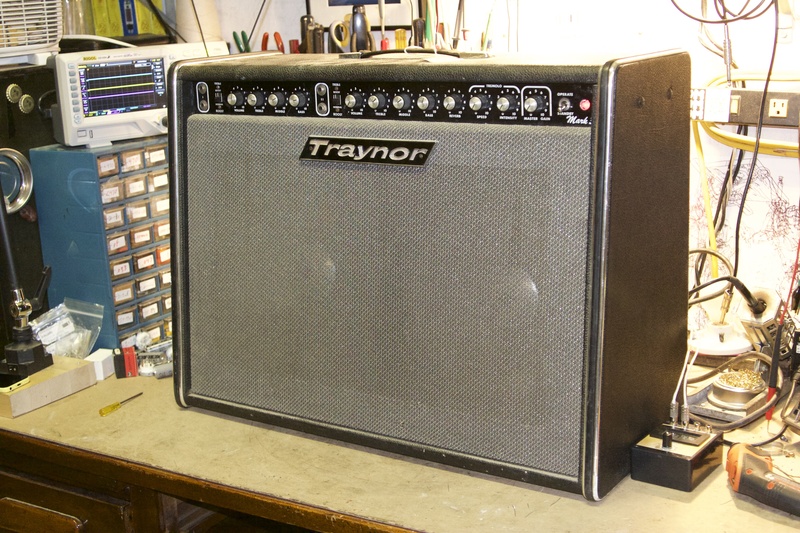 Alright cool old Traynor I believe from late 60s. Maybe a Twin Reverb competitor since it has reverb and vibrato on two channels, high and low inputs, treble boost, etc., the whole deal. Quite a long tag strip in this one. The brown boxes front and center are thyrectors, a part I have never encountered before. They are dual directional diodes used in this case for output transformer protection. They bridge across the two plate leads and if you’re unfamiliar with them and they short it will make you think the OT has gone. Nice signal right up to the power tube grids but at the plates its weak and terribly distorted. When the amp is pushed the B+ drops dramatically. Barely any sound comes through the speakers. Power tubes are burning hot as if they’re putting out 100W. Seems like in other OT protection schemes when the protection fails the amp blows a fuse and shuts down but in this case it does not. I replaced the shorted thyrectors with R3000 diodes from plate lead to ground a la modern Fenders and whatnot. Don’t want to use more thyrectors, they are selenium rectifiers — a component of yesteryear. Selenium is toxic. 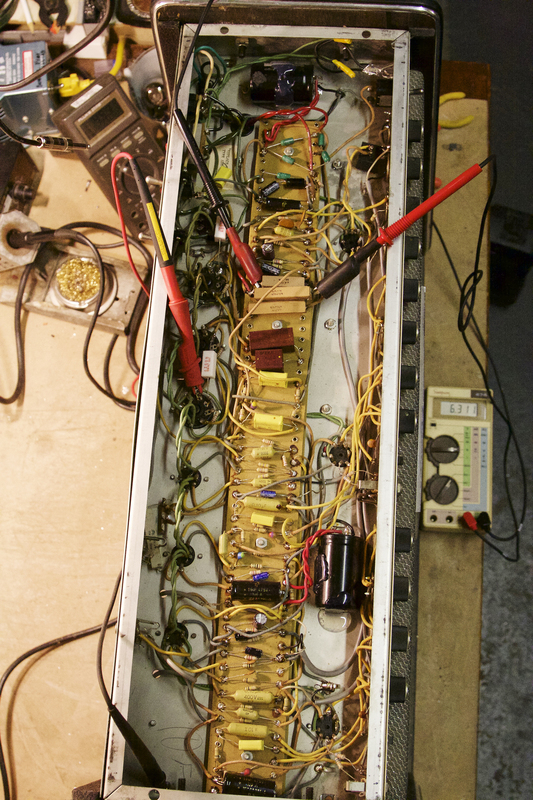 Traynor YGL-3 / 3A Mark-3 schematic. Check it out, power tubes are 6CA7/EL34 and rather than having the suppressor grid tied to ground like is usually the case it is connected to the negative bias voltage at the control grid, for even greater secondary emission suppression.